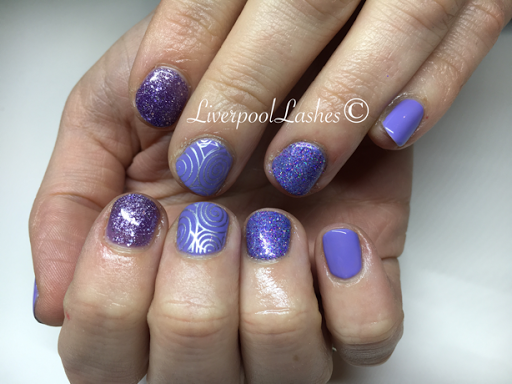 Bethan came to get her nails done for the first time. Her nails are short at the moment due to a dodgy nail tech experience involving a drill and her "Shellac" removal last month. She wanted something on her nails that was fun but didn't stand out as she said that doesn't really fit the way she is. The one thing she was certain of though was that she fancied purple so we worked with that. 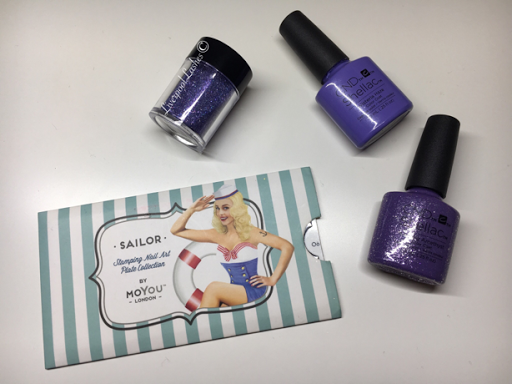 CND Shellac in Wisteria Haze & Alluring Amthyst as well as the new Lecente Glimente Glitter in "Reign" and MoYou London Sailor Plate 06. I'm excited to see Bethan's nails strengthen with the protection of CND Shellac and correct removals but for the time being, these are pretty cute.